Digging Into Dinosaurs | What's In John's Freezer? It was great. I could gush more but that’s not what this post is about. 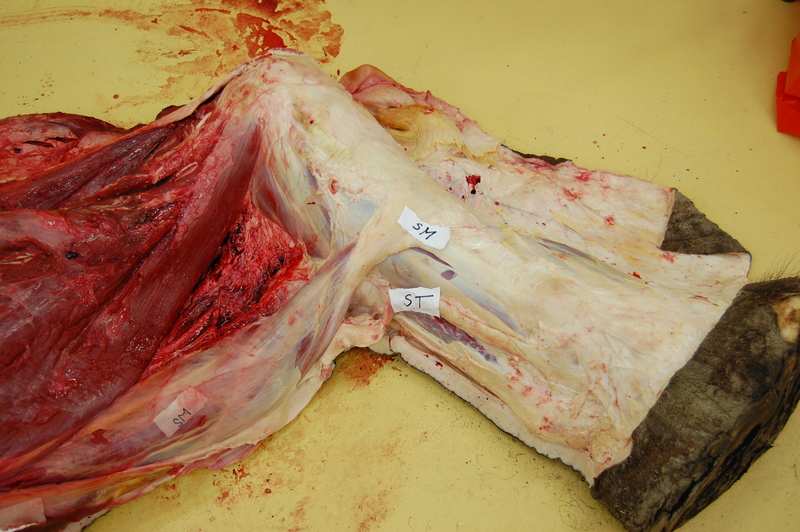 Stomach-Churning Rating: ~7/10; mainly the elephant leg dissection that’s not far below, which is a bit messy. 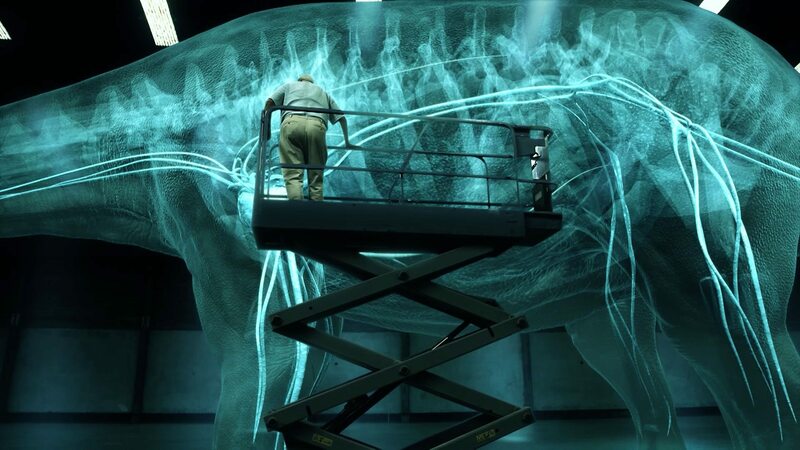 A broader feature of that documentary, which elephants are linked into, is how we can use the skeleton to reconstruct some general aspects of the soft tissue anatomy, and thereby the physiology or even behaviour, of a giant titanosaur. Which brings me to this post’s subject: We dig up dinosaurs all the time, but what about digging into dinosaurs and using what’s preserved to reconstruct what isn’t? 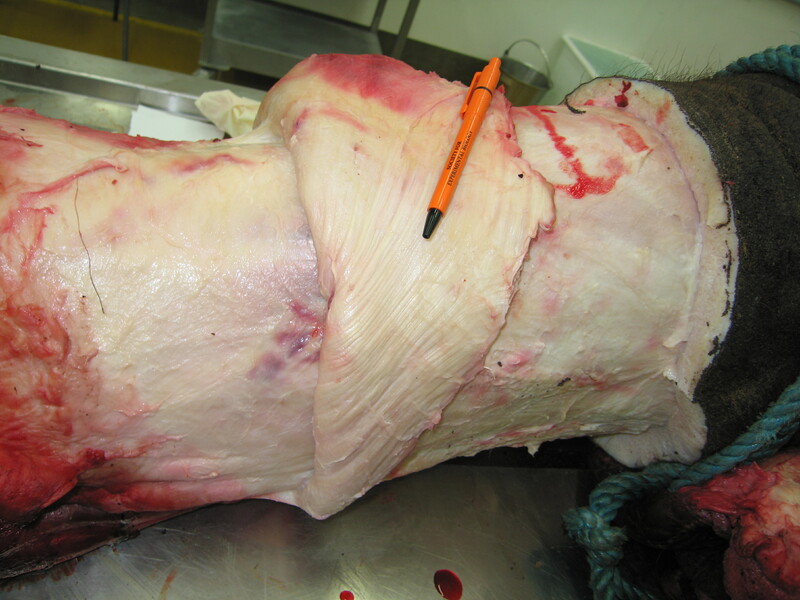 Some of the “G-suit” compressive stocking that the fascia wrapped around elephant, and other large mammals, creates, and the underlying, interwoven muscles and tendons (hindlimb of a young Asian elephant that sadly died in captivity). Did some larger dinosaurs have something like this? I’d expect so. Once the documentary airs, I may be able to share some more images from it showing what they did for the titanosaur, but this BBC photo gives a good idea. Here, blood vessels and other tissues surrounding the skeleton. How would a titanosaur pump blood around its body? A good question. I’ve covered the science behind these reconstructions before, along with the art (in numerous posts, actually). Here I want to inspect how it’s communicated through the media: what are good (and not so good?) ways to cover it, especially now that displaying raw anatomy is more tolerable on TV and other media? I’m not writing about Thanksgiving dinner dinosaur dissections; not really; or in technical terms how we build a dinosaur to dissect/depict internally (digitally or physically). What your (inner?) child most needs is a dinosaur to dissect yourself! 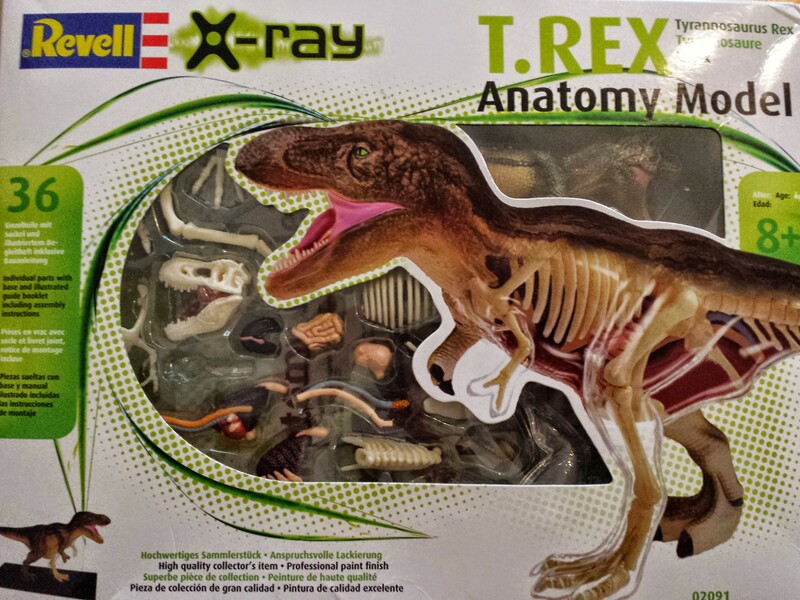 Why not a T. rex toy like this? 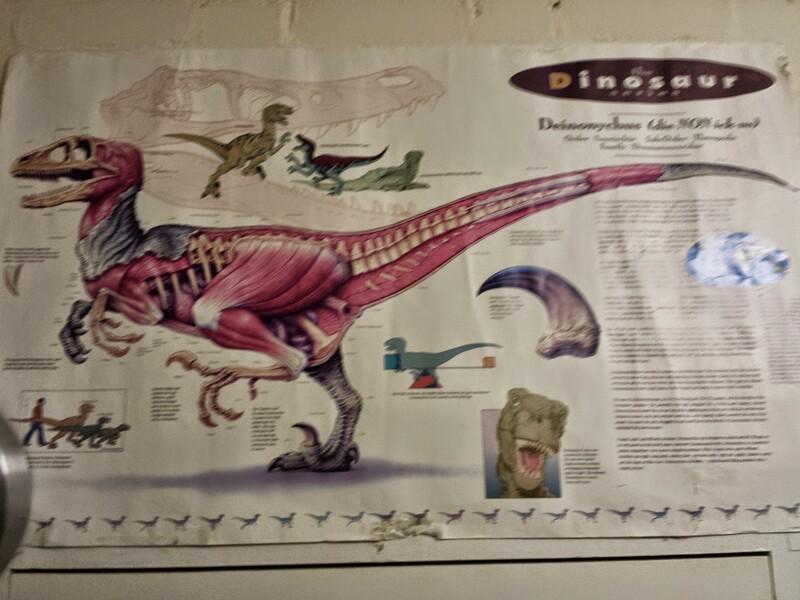 For the price (~$30 in USA), the 4D Vision dinosaurs deliver a pretty good bargain, and the anatomy is satisfactory. I’ve been collecting this series. I could quibble, but hey: it’s a dinosaur you get to build/dissect yourself, and with many major organs in reasonable positions! Not so easy to put/keep together, but it’s fine. I would not pay a ton for it, though. Ornithomimid in Barcelona natural history museum. This was unexpected and got me excited when I first saw it. Looking down onto the opened torso of the Barcelona ornithomimid. Strikingly realistic! Breastbone, heart, liver, intestines; not unreasonable positions and sizes. No feathers, but again hey– this was made in the earlier days. Albertosaurus from the Drexel Academy of Sciences. I forget where I got this pic but I like the display– this is an impressive full-scale physical model. The transition from skeleton-only on the left to skinned in the middle to fully-fleshed and popping out atcha on the right is clever. ?T. rex? 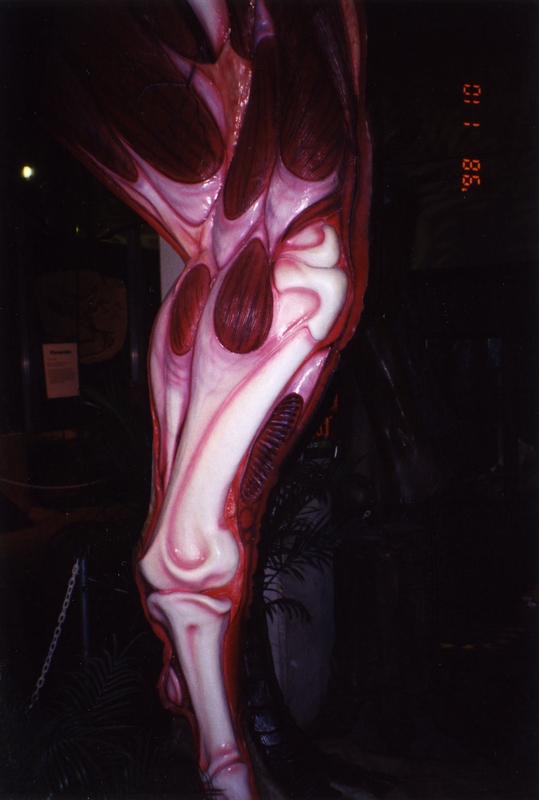 leg, photo that I took ages ago as a PhD student, if memory serves. Can anyone remind me where this was? California Academy of Sciences? I am embarrassed that I cannot recall. I remember geeking out about it. It has a toy-ish look, but I reckon they had to build this to withstand kids touching it. 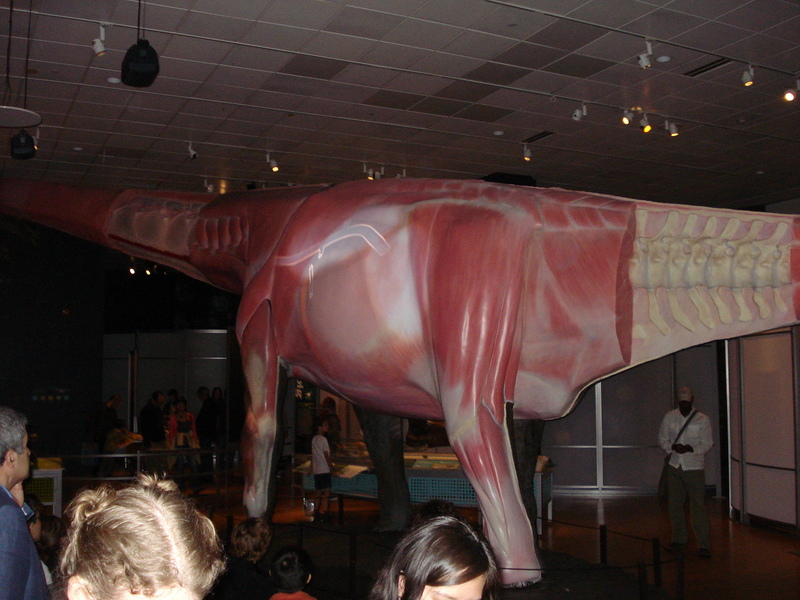 Perhaps the best dino-dissection example I’ve seen in a museum: the AMNH’s sauropod Mamenchisaurus with internal organs and their functions projected onto it, in the “World’s Largest Dinosaurs” exhibit. Bravo! I stood and watched it for quite a while. 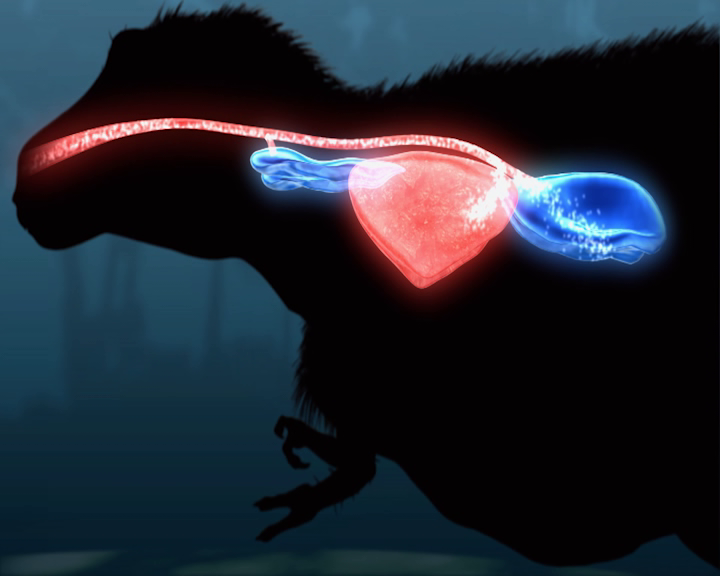 Air flow through a T. rex: simplified but clear. CGI used to explain, not abused. The real air sac anatomy would be too complex to show. You may see something similar with the titanosaur show. That’s enough for now. I’ve stuck with relatively recent examples; of course in my particular field I also think back to Romer’s wonderful 1920’s drawings, which I covered in this post. 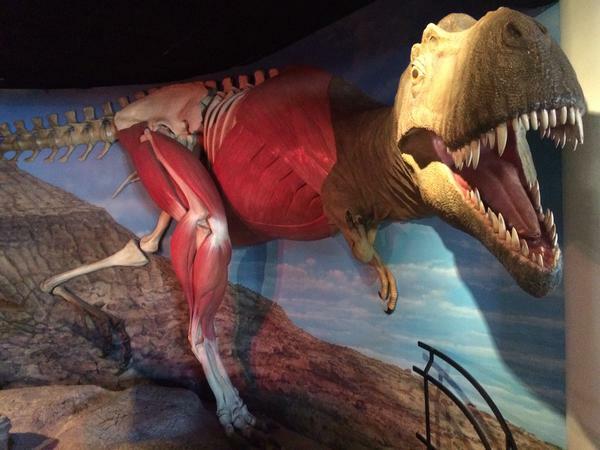 So, blog readers, help me out here: what examples of dinosaur internal, squishy anatomy from museums, documentaries or other not-entirely-done-by-nitpicky-scientists venues do you like, or not like so much? What works for you, or at least is memorable in some way? 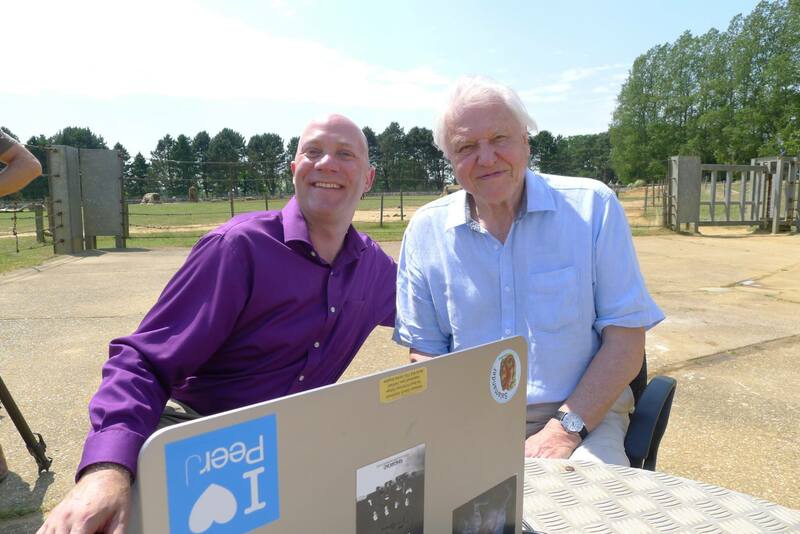 Enjoyed the programme last night, John, and it was nice to put a voice to the face/blog. It would have been interesting to see more discussion of whether elephants really are good analogs for sauropods in terms of their leg anatomy and how it functions. Presumably there are lots of differences too? Thanks for the feedback, Jeff– I appreciate you taking the time! I had fun watching it, myself; the first email about this show came to me in August 2014 so it’s very satisfying to see the end product ~18 months later! On the elephants, we were (as usual w/documentaries) up against the (merciful) 59 minute time limit, I think. There was only time to focus on the key message, which is about how elephants tell us something about sauropod biology. The similarities tell us more than the differences– the differences are harder to make sense of (but of course that is where the fun science lies!). 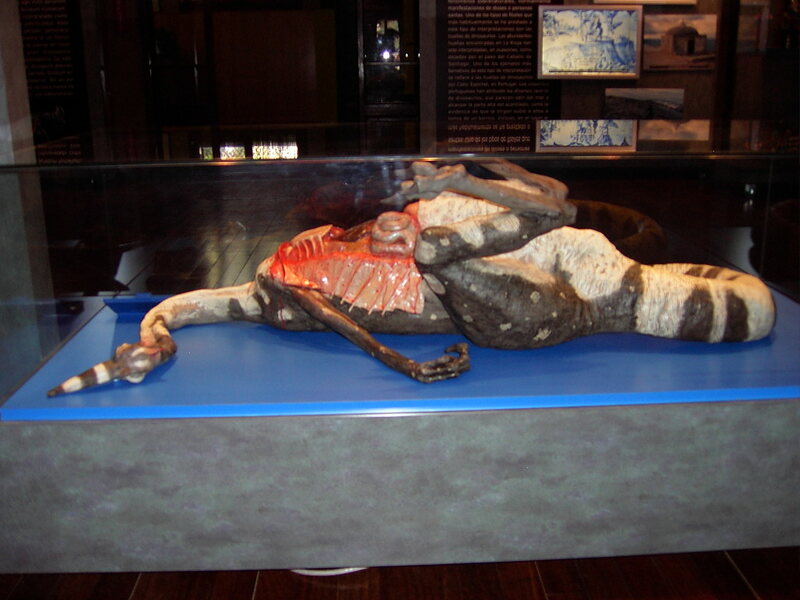 There’s also the quibble that it may have seemed like I “discovered” that sauropods, such as the titanosaur, moved and worked like an elephant, in terms of limbs and feet. Of course, scientifically that’s far from the truth- we’ve known such things for >100 years in many cases. But subtle shortcuts have to be taken leaving room for interpretation over what kind of credit is implied to be given to whom, and that’s the raw truth about how documentaries work (where there’s no way you can give credit to everyone in science) and how science works (where we need to try hard to spread credit around for past data and ideas– a la my prior blog post!). To answer your question about differences more clearly, there are the huge differences in terms of the tail and caudofemoral muscles (which were discussed, albeit more as similarities w/reptiles than as differences from elephants), and then other major differences in terms of the vertebral column (long neck, air spaces, etc) that were discussed, but then other differences such as the amount of cartilage in the limb joints, the proportions and anatomy of the limbs, fore/hindlimb differences, and so on did not have time to be discussed. That’s all covered reasonably well in the scientific literature, although it takes a deep dive to find it all. Thanks John. Yes, I’ve done enough TV and other media to appreciate that it’s usually not possible to get all of the subtleties and complexities across. Thank you for this, it’s great when contributors are happy to expand ideas in a documentary. As a former scientist now working in science and nat hist documentary, we have to continually balance need to simplify for non specialist audience vs simplifying so far that it becomes wrong. Not to mentioned the minefields of credits.. 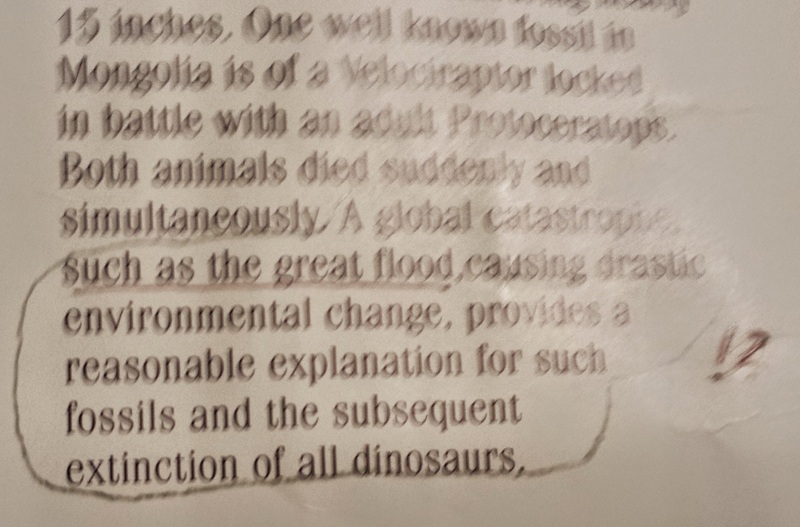 I could add one more point here about my role in the Attenborough and the Giant Dinosaur show: as the show says I did make those calculations about heart size, blood stroke volume and rate, etc, for the interpretations of the circulatory system. They were pretty simple equations I pulled from the literature, mainly papers by Roger Seymour (an authority on the topic) for how such anatomical and physiological parameters change with body mass in living animals. As always, there’s a large potential margin of errors in those estimates (as with the 70-tonne body mass estimated) but no time to discuss such details in a short documentary. Interestingly for me, the estimated heart size fit pretty well into the skeleton when they did the CGI rendering. There was some back-and-forth about that with the production team that was a fun challenge for me as a scientist. I came up with a rough estimate of 237kg using data from birds; using mammal data ended up with values ~400-800kg, which started to seem ridiculous. Also, coincidentally all those calculations I put together were originally compiled for my consultant role in T. rex Autopsy, although in that case the estimated size of the heart (relatively small) left me a bit uncertain and uncomfortable when it became one of the key messages of the programme. But such is the lot of the nit-picky scientist, to always question not only others but themselves, too. My favorite dinosaur soft tissue recon in pop culture has to be the 3D Dinosaur Adventure “Tyrannosaurus Comes Alive” movie. It is a nostalgic part of my childhood, and has a nice mid-90s cheesy soundtrack to boot. 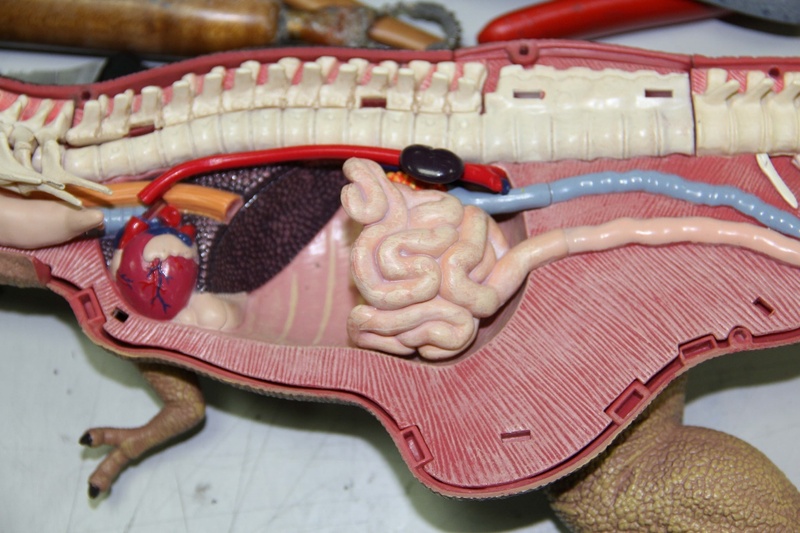 The anatomical accuracy is probably fairly low (especially on the respiratory system). Ah well. My other favorite set of pop-cultural recons were the ones that Mark Hallett did for Zoobooks. I recall that they were mostly muscular in nature, but really were pretty nice. 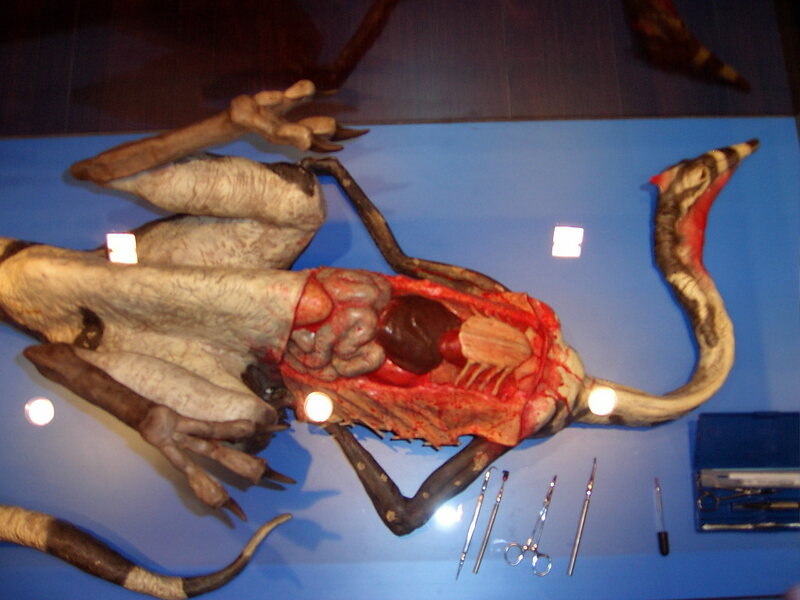 Bakker’s internal organ reconstructions in The Dinosaur Heresies were hugely influential on me, too. So much so that I drafted up a hypothetical digestive system for Coelophysis, complete with gizzard, and sent it off to Mark Norell, then a new curator at AMNH. His response was quite kind, and definitely stoked my enthusiasm. Thanks Andy!! I love that 3D dino adventure movie- had never seen it before today! The locomotion bit ain’t bad at all. 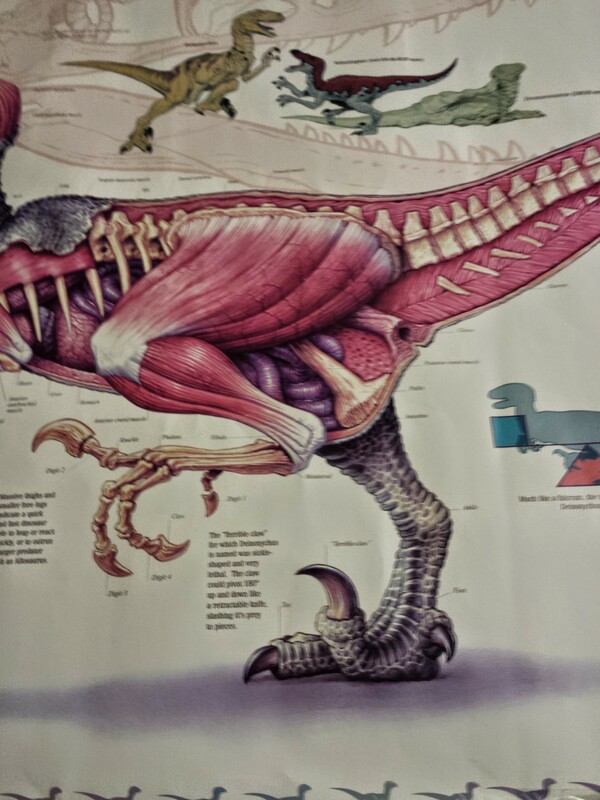 Your comment on Hallett’s Zoobooks reminds me to go back into my office and open up my stack of my old childhood dino books, which I still have- I bet some have some great anatomy there. And wow, that Norell letter is an exemplar of why scientists should always try to reply to letters from the (non-insane) public! During the portion detailing elephant locomotion and how it relates to sauropods, I couldn’t help but notice that the zoo keeper walking alongside the elephant was using a bullhook, or ankus (please, correct me if I’m wrong!). Bullhooks are used mainly to inspire fear in the elephant, very likely instilled at a young age through repeated, err, administration of the device (ie; beatings, jabbing, etc.). Now, in no way am I attempting to criticize you or your work, Dr. Hutchinson. I’ve nothing but respect for the way you conduct yourself online and on television. But I am curious as to your thoughts on this. 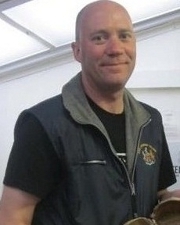 Hi Alexander, thanks- glad you liked the show! I agree, less CGI (as an apparent centrepiece) would be a boon to dinosaur shows in general. On the bullhook, I am aware that it is socially controversial, sort of a symbol of animal mistreatment, to some sectors of society. In my experience, however, with >200 elephants in parks and conservation centres around the world, I have not seen it used (on young/old elephants) in the hyperbolic way it is often described. Maybe I’ve gone to the “wrong” places to witness that but I’ve chosen where I’ve worked with some care, too. I’ve seen it used to apply reasonable gentle pressure or leverage, as a cleaning tool, etc. So that’s my reading of the situation but I am attentive to the alternative views out there. My feeling is that those views have arisen due to the actions of some very bad apples rather than from general practice, especially in practice in finer institutions with people who care more about elephants. The more important thing, to me, is not symbols but rather practice- how elephants are actually treated in real life. I’ve seen lots of good, tender treatment and sensitive relationships between elephants and keepers, and on some rare occasions (not in the UK) I’ve seen some treatment I wasn’t so comfortable with. It’s important for there to be strong regulations regarding such mistreatments and strong enforcement of them, and in plenty of countries those things could improve. It’s a tough situation with elephants in captivity. I’d love to see more of them in the wild, and less poaching, and more habitat for them, and more money for their care and protection, and many other things. I could go on and on but this isn’t really the place for that. In the case of the elephants I worked with on the show, from what I’ve seen in ~10 years working with them intermittently, their treatment has been up to a high standard and that has brought me comfort. My thoughts are that, when seeing a bullhook, people should avoid assuming it is/has been used at that site for cruel purposes, or that keepers holding such a tool are cruel and do not care for their animals. Well, that’s a nuanced and well thought out response if there ever were one. Thank you for allaying my concern! Definite food for thought in there as well. I will avoid making that assumption in the future. I’ve been reading about your work and watching you appear on documentaries since I was in elementary school, so I appreciate you being so open. My pleasure, Alex- and thank you for commenting! I love my blog’s commenters! There’s also the following NHM models. Ahh good, yes- or there were those models! We’ll see if they’re still there once the renovated halls reopen! Hope so. Thanks! !